Khalsa complete a run of five successive home games on Tuesday evening against neighbours Wolverhampton Sporting Community (kick off 7.45pm). Last season’s West Midlands Regional League champions have had a patchy start to their first season in the Midland Football League. After a 2-2 draw on the opening day of the season against fellow newcomers Dunkirk, they secured a first win at Stourport, who Khalsa will be facing in the FA Cup this coming Saturday. After being knocked out of the FA Cup by Haughmond, Sporting have suffered two disappointing defeats, losing by the odd goal in seven in the Wolverhampton derby against AFC Wulfrunians and then suffering a home reverse to Lye Town at the weekend. Not surprisingly given the proximity of the two clubs, there will be a few old boys turning out against their former clubs. Both Josh McKenzie and Mark Ganderton have appeared in Khalsa colours in recent seasons and are now plying their trade with Wolves Sporting. Meanwhile, both goalkeeper Dale Reaney and striker Dan Westwood joined Khalsa from Wolves Sporting. 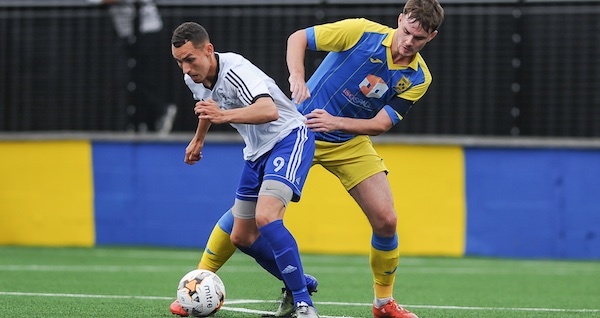 The last meeting between the two sides, was in the JW Hunt Cup final at the Molineux in 2016 which Khalsa won 2-1 thanks to goals from Tes Robinson, Craig Bannister and Dave Meese. Admission is £5, £3 concessions/under 16s. Food and drink will be in plentiful supply, the action will be fast and furious. If you need help finding us, help is here.